Do you plan to renew your real estate license again? A monthly average of 2,025 new Department of Real Estate (DRE) sales agent licenses were issued over the last 12 months ending June 2018. This roughly level with the 12-month average of 2,030 new sales agents one year earlier. 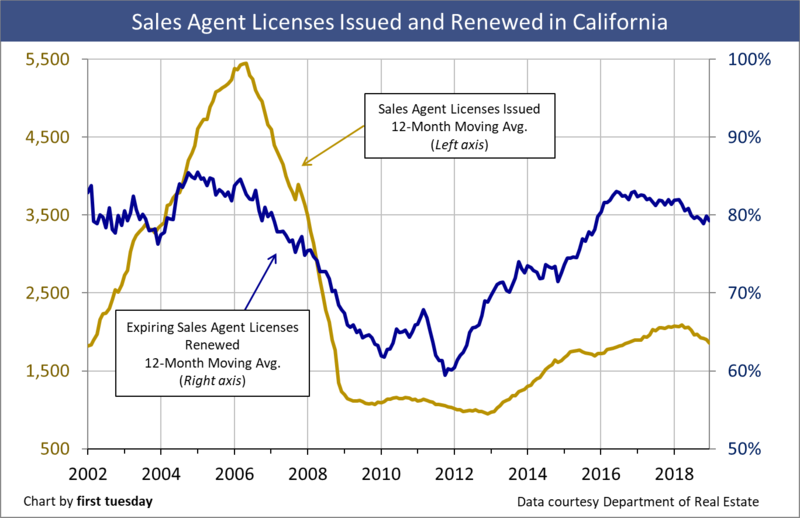 License renewals decreased slightly, with a monthly average of 79.9% of expiring sales agents renewing their licenses over the 12 months ending in June. This is slightly lower than the 12-month average of 81.7% one year earlier. The direct correlation between home sales volume and agent licensing shows licensing movement changes 6-12 months after a consistent change in home sales volume. Today’s decreased renewal rate is directly related to the flat-to-down home sales volume experienced since 2016, which has slowed the flow of agent fees. A total of 287,000 agents and 132,100 individual brokers are currently licensed by the DRE. Expect the number of licenses issued to fall back in 2019 due to lackluster sales volume and the slipping prices anticipated to arrive by mid-2019. A substantial increase in sales agents will occur with the forecasted boom in real estate sales volume and prices. This boom, most likely to occur in the years following 2021, will see the Great Confluence of first-time homebuyers and cash-flush retiring Baby Boomers. Updated August 21, 2018. Original copy released May 2014. Agent licensing and renewal activity fluctuates from month to month. However, the chart above displays a 12-month moving average of monthly licensing and renewal rates, offering a bird’s eye view of the larger trends. So what causes the above-average licensee turnover? One answer is that sales volume directly affects active agents’ income. Brokerage income has suffered heavily over the last several years as sales volume remained flat. Members of the public — the source of prospective agents — never hear about sales volume or how well agents are doing. Instead, the media is infatuated with pricing, touting the 10% and 20% year over year home price gains. The pricing narrative excludes more telling data such as sales volume or the effect of rising mortgage rates. 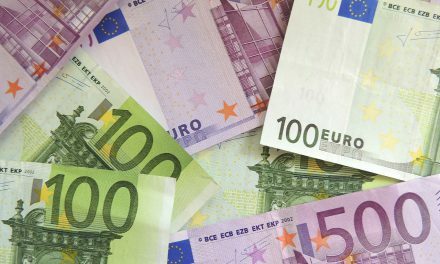 Thus, potential new arrivals see money to be made as prices spiral upward. For them, price momentum undoubtedly means success as a real estate agent is lurking in brokerage offices. Wrong footed, but that is where licensees, old and new, find themselves. The current influx of fresh troops is insufficient to replace expiring, non-renewing agents. Further, new licensees will slow to a trickle the moment stories emerge about falling prices and increasing foreclosure rates, a near certainty once home sales volume decreases following the increase in mortgage rates in 2017. The pass rate for sales agent and broker applicants taking the state licensing exam has remained stable at 53% and 54% respectively over the past 12 months. 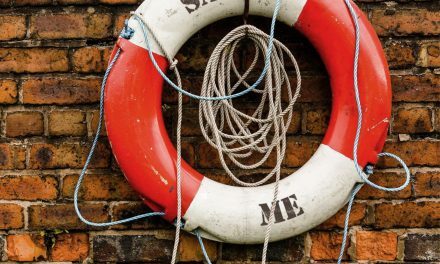 Editor’s note — The percentage of brokers renewing their license is consistently much higher than sales agents, averaging 91% over the past 12 months. With the greater amount of education and experience required to obtain a broker’s license, it’s no wonder the vast majority choose to renew. pass the agent exam (it takes an average of 1-2 months for DRE to process applications before an agent can schedule an exam). When application volume is high, the DRE often experiences processing delays, lengthening the process. New licensing activity is high when the outlook for housing is good, and low during troughs in the housing market. 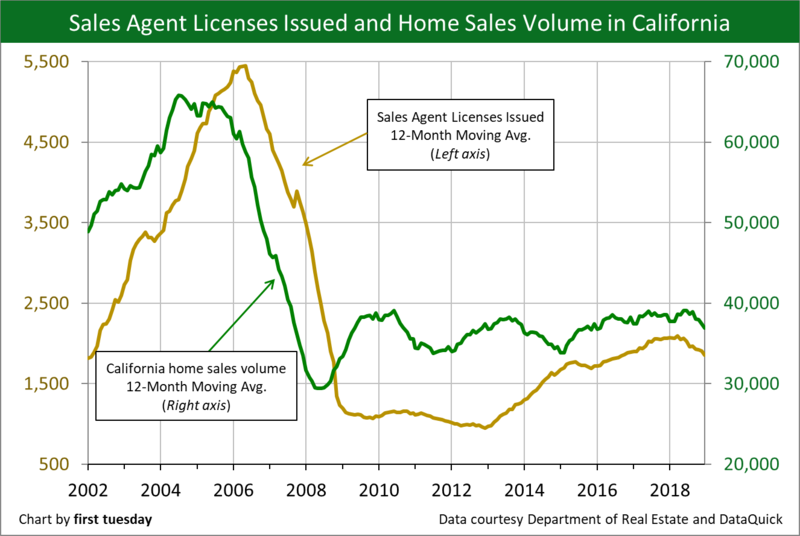 The notable exception occurred following the housing crash, when sales volume rose in 2009, yet agent licensing remained flat. During this time, the word-of-mouth negative outlook on the housing market from the media (not to mention the collection of foreclosure signs on every street) deterred many potential licensees. Agent licensing peaked in 2005 at over 6,000 new licenses issued in a single month. Since then, licensing has bottomed at around 1,000-2,000 new licenses issued each month. The uptick which began in 2014 is likely due to optimistic views of making a living in the “booming” housing market of 2013-2014. What is expected for agent licensing in 2017 and beyond? The number of newly licensed agents in Q4 2016 was higher than Q4 2015. This is due to the continued increase in home prices experienced since 2013 as a result of historically low mortgage rates. Similarly, the overall number of DRE licensees has also increased. Licensing will begin to languish along with home sales volume in 2017 until the next boom in home sales, likely around 2019-2021. Home sales and prices are expected to rise along with the Great Confluence of first-time homebuyers (members of Generation Y) and Baby Boomers retiring and downsizing. The road ahead for agent renewals is a bit more complex. That’s because renewal rates tend to fluctuate based on how long the agent has held a license. For instance, first and second time renewals are less likely to renew than those who have held their license for 10+ years. These long-time agents are less likely to let their licenses go due to the hassles of getting licensed all over again if they decide to get back in. On the other side of the scale, Baby Boomers are set to retire in earnest, and many of the older generation will let their licenses expire. The exceptions are those who qualify for DRE’s 70/30 rule: if a licensee is 70 years or older and has been licensed in good standing for at least 30 continuous years, they do not have to complete continuing education as part of the renewal process. Thus, they are more likely to continue renewing well into their golden years. 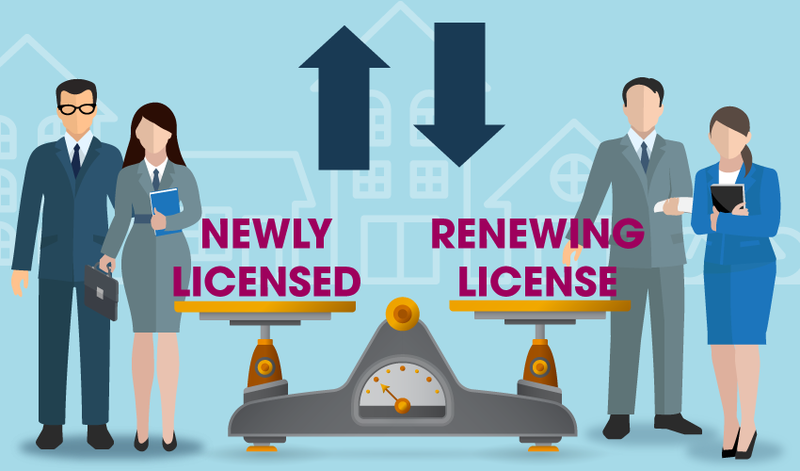 Despite the many facets to forging a forecast for renewals, it’s safe to say that renewals will follow the same trend as licensing. That is, renewals rise following a period of increased home sales, and fall during times of depressed home sales. The only difference is the magnitude of change is lessened for renewals, as seen in Chart 1. That’s because licensees up for renewal know the lengths it takes to obtain a license – and they know choosing not to renew means all that hard work has gone to waste. Even if the housing market isn’t hot now, most will want to be licensed for when it picks up again (and it always does). For a look at historical licensing trends, see first tuesday’s chart, Newly licensed agent and broker population. Oops, I meant to check off the NO’ I will not let my license expire.